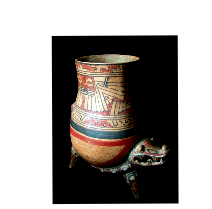 Blackware vessels displaying incised decorations form an important subgroup of Tiwanaku pottery and are classified as fine "Classic" ceramics. 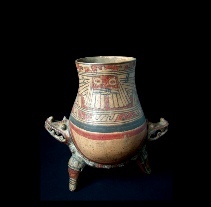 This open vessel has a feline/puma head, flat bottom and tail-handle in rear. Valdivian Phase 2 Rounded Palmer Stone. Made from course Volcanic stone. 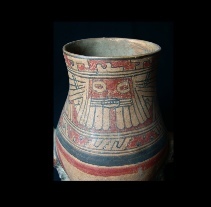 Carefully incised anthropomorphic features covering the front. Measures 3.75" in height 1.5” width. An outstanding decorated anthropomorphic blade. Made of copper in traditional Vicús fashion. Symbolic in material, technique and form. Head is depicting the fierce god - Ai Apec. Detail casting with shell embellishments for eyes and teeth.